I don’t know about you, but as a kid, Christmas was a lesson in patience. The glittering holiday tree perched in the middle of our living room was a month long reminder of “can’t open till Christmas”. Every December I stood in a serpentine line at the mall waiting to talk Santa, only to discover on Christmas morning, my mother–not Santa granted wishes. Similarly, the makings of culinary deliciousness filled our refrigerator and cabinets, but we were denied said deliciousness until Christmas dinner. This year, I’ve decided to be a rebel and distribute this Christmas gift early! Everyone on the Siera London mailing as of December 4, 2016 will receive a free copy of my holiday novella, A Doctor for Christmas. In this sweet novella, you meet Aron Walters and Zari Okoro before their marriage in Chasing Ava, the first book in the Bachelors of Shell Cove series. 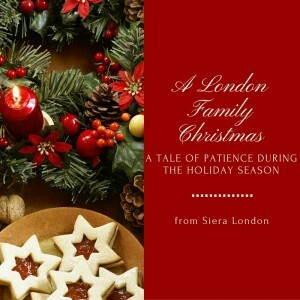 For Christmas Eve, Aron and Zari get a lesson in patience and a second chance at love.